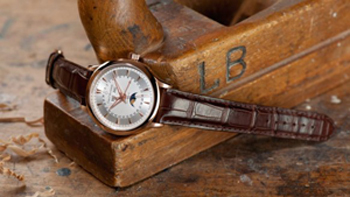 The Manero MoonPhase Carl F. Bucherer is a new men’s watch, which is characterized not only by their elegant design, but also through the moon phase calendar. This reveals the timepiece in a style typical of the Manero line. In the timeless splendor of the Manero MoonPhase Carl F. Bucherer presented by her red-gold case, which has a diameter of 38 millimeters. Even though it is evident in the clock is a model for the lords of creation, the clock fits perfectly to the woman’s wrist. Behind the one-sided anti-reflective sapphire crystal, the silver-colored or black dial hides with its clear layout of the elements. Classic as ever, the golden-red pointer in the center of the display of hours, minutes and seconds responsible. A fourth central hand allows you to read the date. Day and month can be read via a small window at twelve o `clock. But the real eye-catcher is certainly the moon phase calendar in six clock. The fascination for the small satellites lasts for ages and is still widely prevalent. The heart of the Carl F. Bucherer Manero MoonPhase is the automatic ETA caliber CFB 1966th with a modulus of Dubois Depraz that has a power reserve of up to 42 hours It can be observed through the sapphire crystal case back at work, even if the sight of the calendar is even more impressive on the dial.